The Aorus AD27QD tactical display offers a 144Hz QHD IPS gaming screen that has all the essential features plus a few added advantages via its feature-rich OSD. This new RGB-fied monitor was recently announced at CES 2019, creating a healthy headstart for a display that provides the current spec sheet sweet spot. The product is Gigabyte/Aorus’ first foray into the gaming display, but does it have what it takes to impress the enthusiasts like the brand’s GPUs and motherboards? The Aorus AD27QD took an aesthetic formula that works for modern tastes and slightly modified it to fit the looks of its offerings and branding. The company is partial to aggressive lines and sharp angles, resulting in a device that looks gamer-centric but doesn’t go overboard into the gaudy category. The monitor’s nice matte black finish is always preferred, and we’re slightly thankful the designers did not overuse the bronze orange found on other Aorus offerings. 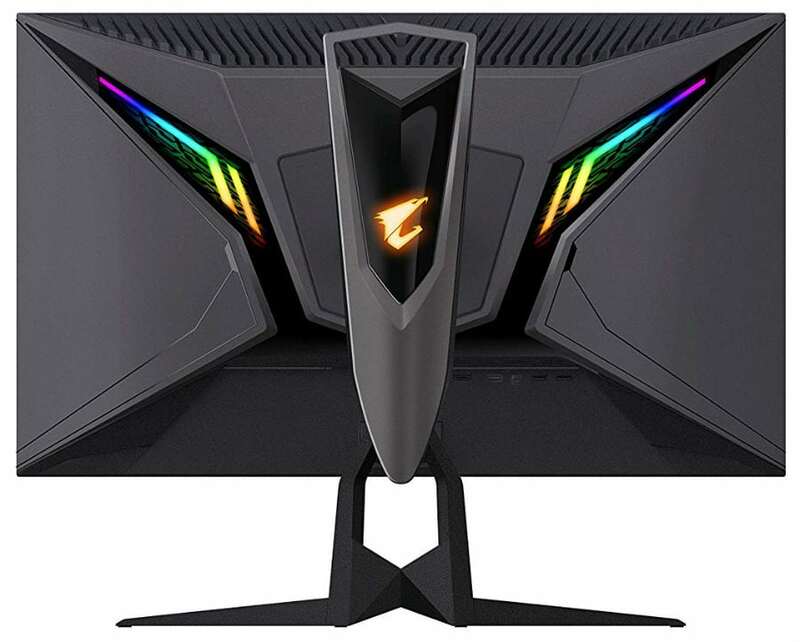 Aorus did exceedingly well in designing the AD27QD Tactical Display, providing a monitor that’s healthily aggressive-looking unlike some of its GPU offerings. The futuristic design works well because the firm toned down on other decorative features such as colored streaks or strips. But one thing they were blatantly unapologetic is the RGB lighting on the display which is spread all over the back. The display is bezel-free, save for the bottom strip which isn’t too distracting but could deter multi-display users who prefer portrait mode. The monitor’s proportions are within reasonable limits, but the uniquely designed stand adds a few inches of depth that you might want to consider. Build quality is very solid, so we have no doubts that this pioneering model is excellently durable. The included stand is one of the best looking representations we have seen to date when it comes to designs focused on gaming. The penguin-feet base provides fantastic stability, while the spaceship-looking upright offers great ergonomics. You can tilt, swivel, and pivot the display, plus you can adjust height with a travel range of 5.1 inches. The first unique characteristic of the Aorus AD27QD which is marketed by the Tactical Display moniker is the product’s connectivity layout. The usuals such as DisplayPort 1.2 and dual HDMI 2.0 slots are present along with USB slots for your peripherals. But what separates this display is the 3.5mm audio in/out jacks which are imbued with noise-canceling technology for clearer sound. However, take note that you have to connect one USB port to your PC to allow the Aorus AD27QD to utilize its noise-canceling properties. Doing so will open the mic jack to receive and transmit audio which is filtered to have less unwanted noise than directly directing it to your mobo’s I/O. 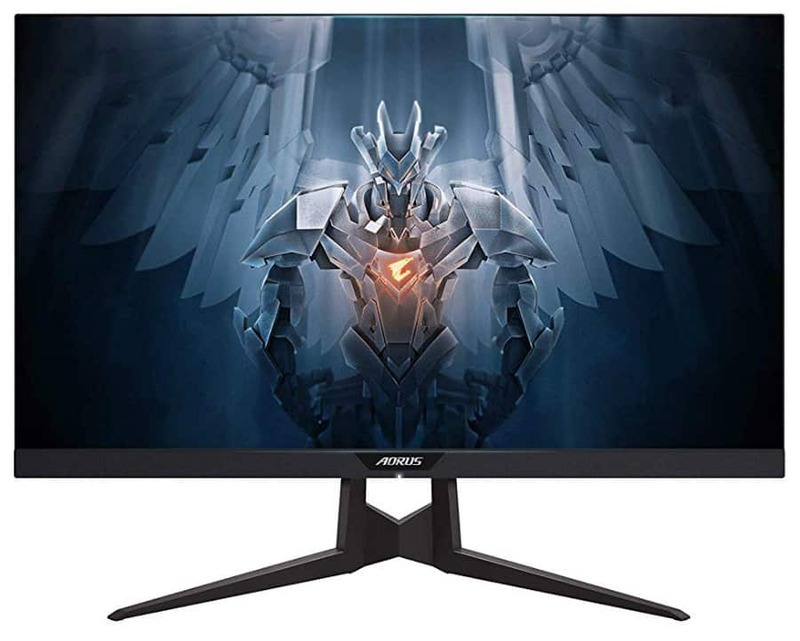 The Aorus AD27QD Tactical Display packs a 27-inch IPS panel with a 2560 x 1440 resolution, 144Hz refresh rate, and a 4ms response time that can be tightened to 1ms MPRT. The monitor has a 400cd/m2 backlight and a 1000:1 rated contrast ratio that goes along with extensive gamut coverages. The product is certified with DisplayHDR 400 which is the bare minimum for HDR gaming as listed by VESA. The Aorus AD27QD is capable of excellent performance in color output thanks to its high-quality IPS panel. A colorimeter reveals that the display is capable of 100% sRGB with a little excess which in turn, equates to 89% Adobe RGB. This score falls a bit short of the manufacturer’s claims, but most competitors would struggle to equal or exceed this result. Color accuracy is fantastic at Delta E .92, ensuring that images on the screen are lifelike and spot-on. These scores are readily achievable once you break the Aorus AD27QD out of the box, so calibration isn’t necessary for most users. However, take note that there will be some differences between unit to unit since no two modules are made equal. The backlight for the Aorus AD27QD reaches a scorching 458cd/m2 of illumination at 100% brightness which exceeds its rating on the spec sheet. One thing that suffers, however, is the panel’s contrast ratio which plays between 800:1 to 900:1 depending on your brightness settings. Black levels and grayscale outputs could use some improvements, especially since most premium IPS displays could already exceed 1000:1 easily. Panel uniformity is average for the Aorus AD27QD due to the deviances in color in two of the corner quadrants. Differences in illumination level remained under 14% which will be unnoticeable to most users, so gaming will mostly be undisturbed. The color variance on the top and bottom corners are alarming when you look at the colorimeter results, but it would take some squinting to even notice the difference. The panel doesn’t handle motion perfectly, so the promise of an IPS panel that is almost as fast as TN is broken. You need to use the monitor’s overdrive features to get rid of the ghosting. However, the maximum setting will induce overshoot. You can also use the monitor’s 1ms MPRT feature that’s called Aim Stabilizer in the feature-packed OSD, but it does have repercussions. The display’s refresh rate will be fixed to 120Hz or 144Hz, plus the brightness will drop considerably. High-level FPS gamers may prefer this mode, but based on feedback, most users would rather the mentioned settings unhindered for more eye candy. As such, we feel confused about the Aorus AD27QD’s gaming pedigree since it has average results in pixel response time. The monitor’s intended market requires the fastest and the best when it comes to motion handling, and the results are a bit underwhelming. The overall performance is great and reasonable for an IPS panel, but it’s surprising that there are VA models that are tested to have more agile pixels than this model. Don’t get us wrong; we still love the Aorus AD27QD due to its plentiful features which gamers can use to maximize the display according to their needs. The Tactical Display name describes these add-ons such as the mentioned Aim Stabilizer, along with customizable crosshairs and overlay counters. You can even control the menus via the optional Sidekick app for Windows which is even more convenient than the joystick button. The Aorus AD27QD is a FreeSync monitor with a functional range of 48Hz to 144Hz. This feature was previously locked to AMD GPUs, but you can enjoy adaptive sync via Nvidia’s latest compatibility initiative. This model is tested to be compatible with Nvidia GPUs, although you manually have to turn the feature on in Nvidia’s driver control panel. Input lag for the Aorus AD27QD averages at 9ms, indicating that delays will not be easily felt or seen. The monitor handles responsively for titles such as PUBG or Rainbow 6 Siege where a fraction of a second count. The Aorus AD27QD is a well-designed monitor that deserves its Tactical Display name thanks to the abundance of gamer-centric features. The OSD is rich in tools which can help you gain an advantage, but we reckon the fun is in testing or trying out the many features of the OSD. The design is one of our new favorites due to its balanced attractiveness that’s splashed with a very generous touch of RGB lighting. The only thing that breaks the Aorus AD27QD’s greatness is its motion handling and a few essential image qualities. We feel that there are faster IPS gaming monitors out there, plus the screen could use some improvements in contrast and uniformity. Overall, the Aorus AD27QD is a top pick if you are in the market for a 144Hz QHD display that is excellent for first-person shooters and competitive gaming. Hi, Alex! The Aorus AD27QD is a better pick since its better designed and its more accurate. QHD images will also look sharper on this monitor due to the smaller screen, so you have a higher pixel count per square inch. The only advantage of the Asus XG32VQ is it is, of course, larger, and its slightly faster. Hi, Sol! Search for Sound in the search bar (windows 10) or via windows control panel and check to see if Aorus AD27QD is in the list of audio devices. You need to set it to your primary if you want to use its speakers. What is your recommend this mornitor vs asus pg279q ? This are cheaper but asusu have better performance? Hi, Badrobot! The Aorus AD27QD is an excellent gaming monitor, but the PG279Q is better if you have an Nvidia GPU. Both have great image quality and responsiveness, so you can’t go wrong either way. Hi, I was wonder how to access the gaming monitors settings? I understand pressing the button under the monitor, but how do I access it with my mouse? Hi, Nik! You need to download the OSD Sidekick app from Aorus’ page of the AD27QD. Good luck! Hi, i am about to buy this monitor but need confirmation. Can i Turn on G-sync on with HDR? also this is G-sync compatible, is there a big difference between this monitor and G-sync built-in hardware monitors? Hi, Auron! The Aorus AD27QD is G-Sync compatible, but there are some reports of crashes or black screens from users on several forums. If you are keen on this monitor, make sure that you do a thorough driver clean up using DDU before installing the G-Sync compatible drivers from Nvidia. If you get it to work like half of the owners around the globe, then there should be no problem running HDR with G-Sync. Hey, thanks for the good review. I’m a BenQ Zowie 2430T (TN) user, i’m mostly playing high level competitive (Overwatch). My current monitor is not very fresh and certainly wasn’t perfect at the start. Do you think ghosting is noticable while playing with the Aorus monitor when you come from TN 144hz 1ms ? Hi, Vangelys! The Aorus AD27QD has excellent color and a higher resolution, so it should be able to offer a substantial upgrade to your BenQ XL2430T. The HDR feature is just a bonus, but it isn’t comparable to HDR capabilities found on TVs. The ghosting shouldn’t be an issue for you like most of the users unless you have very sensitive eyes. Cheers! Is this a monitor for USE with a ps4 pro? Or only a monitor to be used with a PC? Hi, Kim! The Aorus AD27QD can be used with a PS4 Pro, but it isn’t ideal since the console does not natively support 2560 x 1440 at higher refresh rates. I’m going to buy this monitor. You would choose this or Samsung C27HG70? The monitor will be used for games and movies. Hi, Dusan! We did not get to review the C27HG70, but we can recommend the Aorus AD27QD for competitive gaming, which is its primary purpose. Cheers!